By checking this box you acknowledge that this piece of equipment must be connected with an Ethernet cable to the local area network. 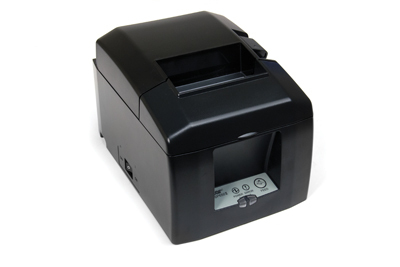 The Star Micronics TSP654K Ethernet LAN thermal receipt printer is designed for applications that require liner free labels. 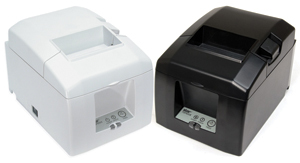 Features include a fast, efficient, and reliable receipt printer that connects via your local area network (LAN) to an Apple iPad running Square Register. 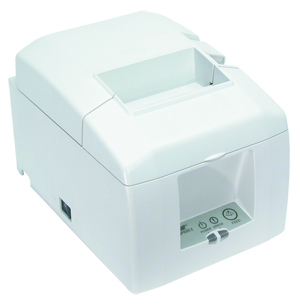 This printer is perfect for those with an existing local area network (LAN) or are able to run an Ethernet connection from the router to the location of each printer. Hard wiring printers provides a time tested solution that eliminates the nuances of wireless connectivity. As a rule of thumb if you can wire, wire!! The TSP654K Ethernet prints at 300mm per second, fast enough to make a regular receipt in less than one second. 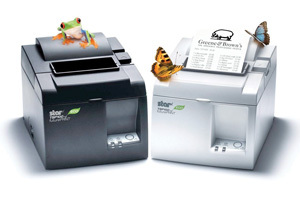 Thermal receipt printers use heat to print receipts on special heat-sensitive paper. This printer is unique in that it utilizes liner free rolls of restick paper. They are fast, quiet, and clean to operate. TSP654K Ethernet has an auto-cutter that severs receipts so they are easy to grab and is compatible with 80 mm (3 inch) liner free maxstick thermal receipt paper. Connect TSP654K Ethernet to a compatible cash drawer to open the drawer straight from the Square Register app. Accessories include splash proof covers, vertical stands, wall mount brackets and extendable warranties like the Swap-a-Star or Extend-a-Star warranty.